Day One. 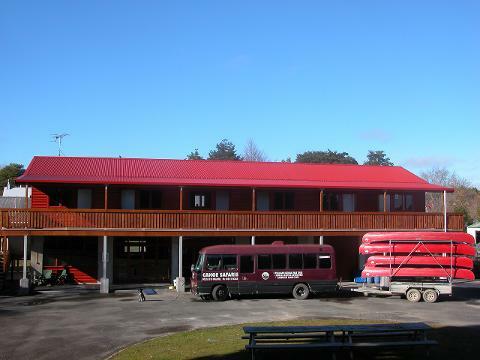 We depart Ohakune between 7.30 and 8.00am for the river. 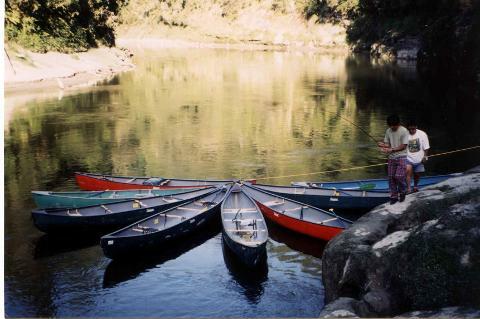 At Whakahoro we unload canoes and barrels and show you how to pack your canoe. Guides then give a talk on river and campsite safety, and then instruction on how to paddle your canoe. On most trips we have 2 guides so if you are a little nervous you are welcome to paddle with a guide for at least the first day. Once the guides are satisfied that everyone can steer their canoe then the group sets off on the river. The gorge starts to narrow and we leave the last road access point behind at Whakahoro - the second and final mooring point for the Houseboat. We pass Laceys and Wades landings and several old maori Kaianga. Later in the morning we pass Mangapapa campsite, Man of War Bluff, Kirikiriroa where the river does a huge horseshoe turn, the Verandah, the Whirlpool and on down to Tamatea's Cave and a possible lunch stop at Ohauora campsite. There is plenty of time for stops along the way and there are many safe places to get out and swim. We camp at John Coull Hut and campsite. Day Two. Breakfast and on the river at 9am. A morning paddle past the Tangarakau and Whangamomona rivers, Mangawaiiti campsite, and Otumangu landing - one of the post WW1 faming settlements. Shortly afterwards we see the first pine trees since Whakahoro (planted by the early settlers), and we stop at the Mangapurua for lunch and a walk to the Bridge to Nowhere (45 min each way). After the walk we are met at the river landing by the Jeboat that will then take everyone plus gear on a thrilling ride down the river 23km to Pipiriki. At Pipiriki we are met by our bus that will then take everyone back to our base in Ohakune (1 hour). Finish approx. 5pm.